To move elements around we should be familiar with coordinates. Relative to the window(or another viewport) top/left. Relative to the document top/left. It’s important to understand the difference and which type is where. Window coordinates start at the upper-left corner of the window. bottom – Y-coordinate for the bottom element edge. Window coordinates do not take the scrolled out part of the document into account, they are calculated from the window’s upper-left corner. In other words, when we scroll the page, the element goes up or down, its window coordinates change. That’s very important. If you scroll the page, the button position changes, and window coordinates as well. Coordinates may be decimal fractions. That’s normal, internally browser uses them for calculations. We don’t have to round them when setting to style.position.left/top, the browser is fine with fractions. Coordinates may be negative. For instance, if the page is scrolled down and the top elem is now above the window. Then, elem.getBoundingClientRect().top is negative. 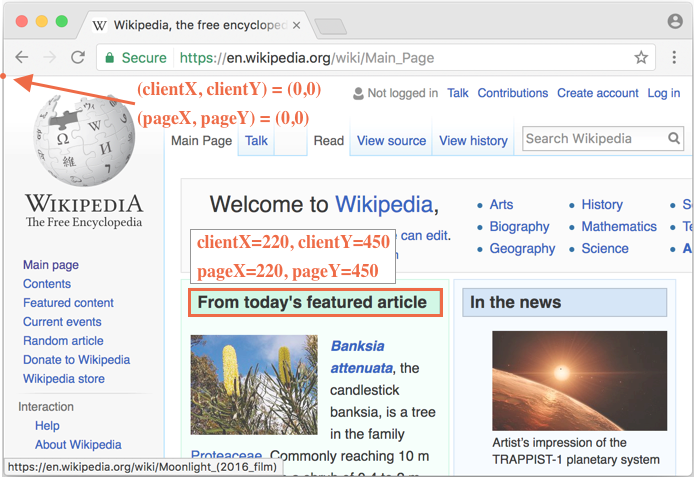 Some browsers (like Chrome) provide additional properties, width and height of the element that invoked the method to getBoundingClientRect as the result. We can also get them by subtraction: height=bottom-top, width=right-left. If we compare window coordinates versus CSS positioning, then there are obvious similarities to position:fixed. The positioning of an element is also relative to the viewport. But in CSS, the right property means the distance from the right edge, and the bottom property means the distance from the bottom edge. The call to document.elementFromPoint(x, y) returns the most nested element at window coordinates (x, y). As it uses window coordinates, the element may be different depending on the current scroll position. The method document.elementFromPoint(x,y) only works if (x,y) are inside the visible area. If any of the coordinates is negative or exceeds the window width/height, then it returns null. In most cases such behavior is not a problem, but we should keep that in mind. elem.style.background = ''; // Error! Most of time we need coordinates to position something. 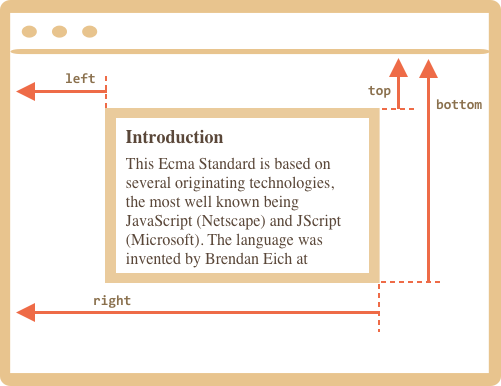 In CSS, to position an element relative to the viewport we use position:fixed together with left/top (or right/bottom). We can use getBoundingClientRect to get coordinates of an element, and then to show something near it. // assign coordinates, don't forget "px"! The code can be modified to show the message at the left, right, below, apply CSS animations to “fade it in” and so on. That’s easy, as we have all the coordinates and sizes of the element. But note the important detail: when the page is scrolled, the message flows away from the button. The reason is obvious: the message element relies on position:fixed, so it remains at the same place of the window while the page scrolls away. To change that, we need to use document-based coordinates and position:absolute. Document-relative coordinates start from the upper-left corner of the document, not the window. In CSS, window coordinates correspond to position:fixed, while document coordinates are similar to position:absolute on top. We can use position:absolute and top/left to put something at a certain place of the document, so that it remains there during a page scroll. But we need the right coordinates first. For clarity we’ll call window coordinates (clientX,clientY) and document coordinates (pageX,pageY). And if we scroll it, then (clientX,clientY) change, because they are relative to the window, but (pageX,pageY) remain the same. 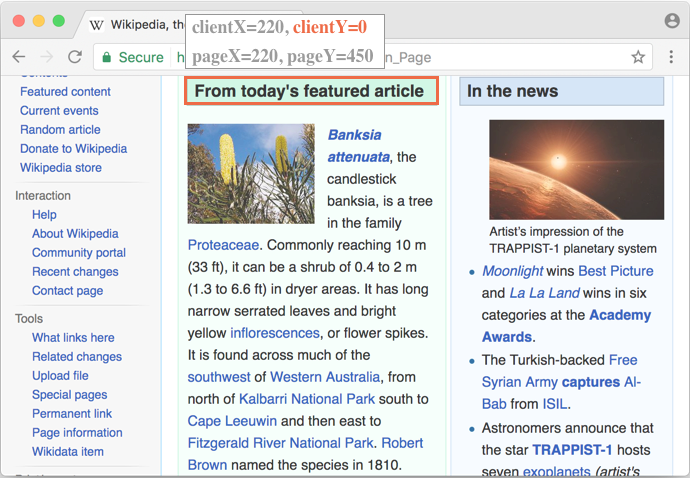 clientY of the header "From today's featured article" became 0, because the element is now on window top. clientX didn’t change, as we didn’t scroll horizontally. pageX and pageY coordinates of the element are still the same, because they are relative to the document. There’s no standard method to get the document coordinates of an element. But it’s easy to write it. pageY = clientY + height of the scrolled-out vertical part of the document. pageX = clientX + width of the scrolled-out horizontal part of the document. Relative to the window – elem.getBoundingClientRect(). Relative to the document – elem.getBoundingClientRect() plus the current page scroll. Window coordinates are great to use with position:fixed, and document coordinates do well with position:absolute. Both coordinate systems have their “pro” and “contra”, there are times we need one or the other one, just like CSS position absolute and fixed. Create a function positionAt(anchor, position, elem) that positions elem, depending on position either at the top ("top"), right ("right") or bottom ("bottom") of the element anchor. Call it inside the function showNote(anchor, position, html) that shows an element with the class "note" and the text html at the given position near the anchor. P.S. The note should have position:fixed for this task. In this task we only need to accurately calculate the coordinates. See the code for details. Please note: the elements must be in the document to read offsetHeight and other properties. A hidden (display:none) or out of the document element has no size.